When I decided to run for the US Senate in 2012, the experts told me that we’d probably need to raise $20-30 million to have a shot at winning. I was stunned. How much? The most experience I had raising money was selling cookies for my daughter’s Girl Scout troop. And let’s just be blunt: The big Wall Street banks and giant corporations weren’t lining up to help someone who spent years fighting for stronger rules and more accountability. But we didn’t listen to the naysayers – and we didn’t compromise our values. 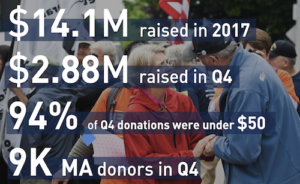 We proved that when people in Massachusetts and across the country chip in $5 or $10 at a time – when hundreds of thousands of people invest in a campaign – we can take on even the most powerful interests. And ever since we ran the biggest grassroots campaign in Senate history, I’ve tried my hardest to live up to our t-shirt slogan: the Best Senator Money Can’t Buy. That’s still possible thanks to your generous support of our 2018 re-election campaign. We just finished tallying the numbers for the last fundraising quarter of 2017, and we’ve raised another $2.88 million. There’s only one thing to say: THANK YOU. You’re incredible. Donald Trump, Mitch McConnell and the Republicans have made their agenda clear: They want to rig the system for the rich and powerful, and they don’t mind leaving everybody else behind. And while working people keep getting sucker-punched by one reckless policy after another, the Republicans are blaming people who don’t look like you, or act like you, or pray like you. Well I’ve got news for Donald Trump and his buddies: We won’t let ourselves get drawn into their politics of fear and hate. We won’t let ourselves get pounded by nasty attack ads from shady right-wing Super PACs with billionaire donors. And we will not back down one inch from our fight to level the playing field for working families. This isn’t my fight – this is our fight. And with your help, we’re just getting started.